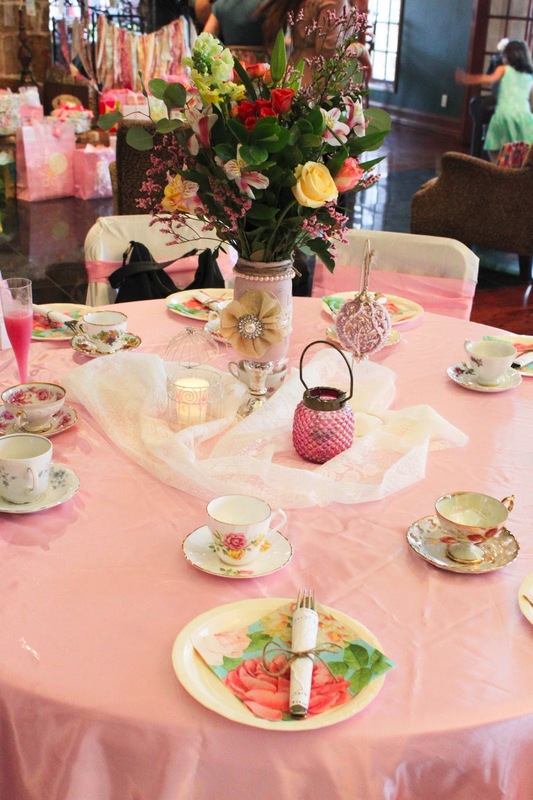 Theme: My mom picked the theme of the shower, which was a shabby chic tea party. When she asked me what I thought about that theme and incorporating: lace, pearls, burlap, mason jars, bird cages, floral print, pink & cream, I was beyond excited. 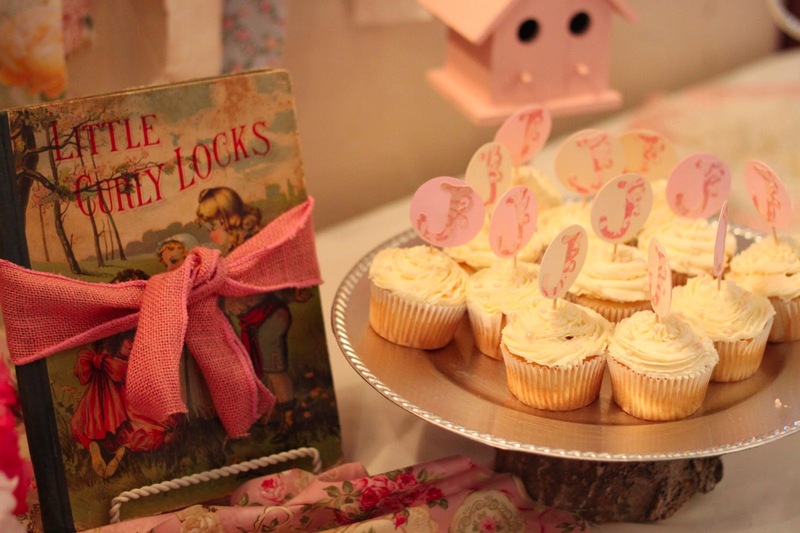 I decided to decorate Julianna's room very shabby chic so having her shower shabby chic just seemed so perfect! 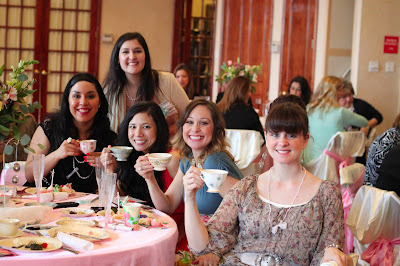 And if you are anything like me (a total girly-girl) then what is not to love about a tea party?!?! (Sign-In table) The sign-in table was just precious. 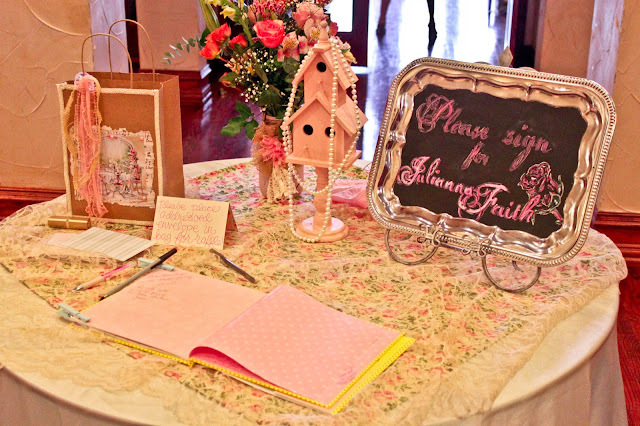 I just love Fancy Nancy books, so my mom found the Fancy Nancy Tea Parties book and she used it as the sign-in book for all of the guests. 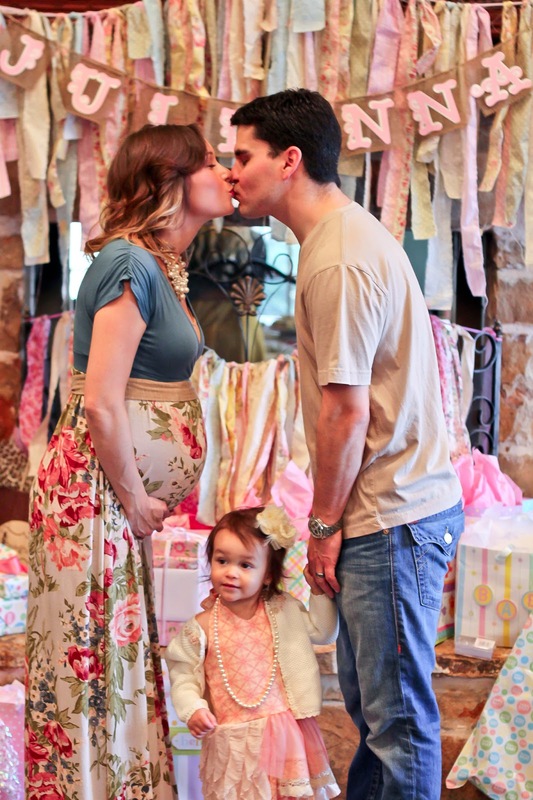 She did the same thing at Josselyn's shower. So now both of my girls have a special books full of sweet messages from all their loved ones. 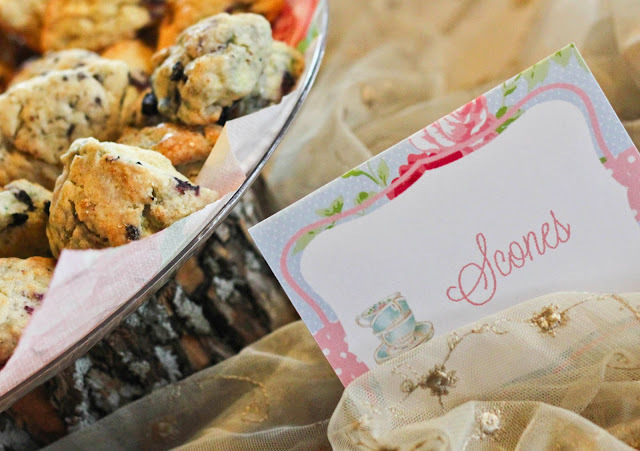 I also loved the idea of having the guests address an envelope with their name & address. These envelopes got raffled at the end of the shower for a prize (which the guests loved) and now I do not have to address 50 envelopes when I am writing thank you cards (which I love). (Center pieces) The center pieces were just stunning! My amazingly talented friend Jen is a former florist, so she put together all of the beautiful flower arrangements. I do not think I have ever seen such lovely arrangement. 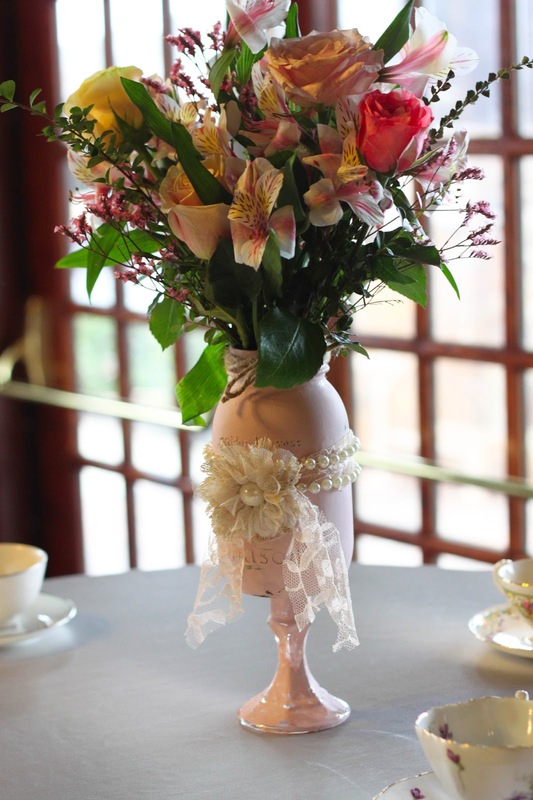 She used pastel colored roses, lillies, babies breath, etc. 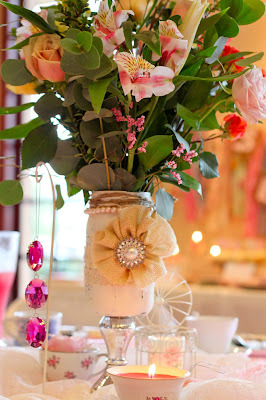 Now what made the flowers even more fabulous were the gorgeous mason jar vases that they were in! My mom is amazing and she has become a Pinterest pro haha She bought glass mason jars at Hobby Lobby and then she painted them with milk paint and glued them onto silver candle sticks. 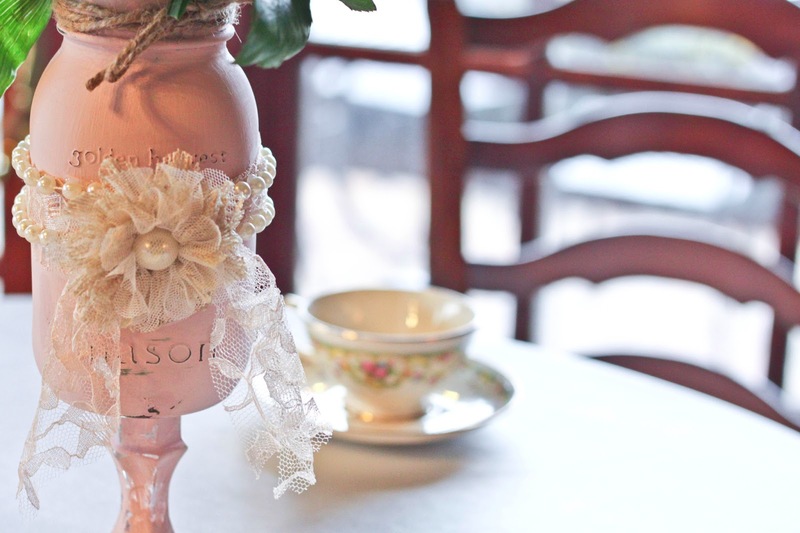 Then she took the jars to a whole new level and embellished them with burlap, lace & pearls!!! The vases were so gorgeous that I brought 3 of them home with me! 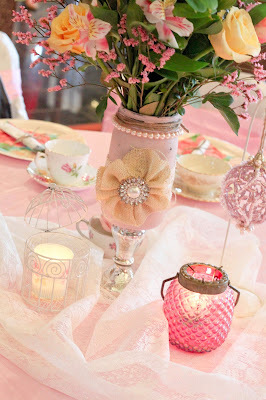 I honestly do not think I have ever seen mason jars this beautiful before. Not only were there gorgeous flower arrangements on each table but each table had the cutest, eclectic, shabby chic looking antiques around each flower arrangements. 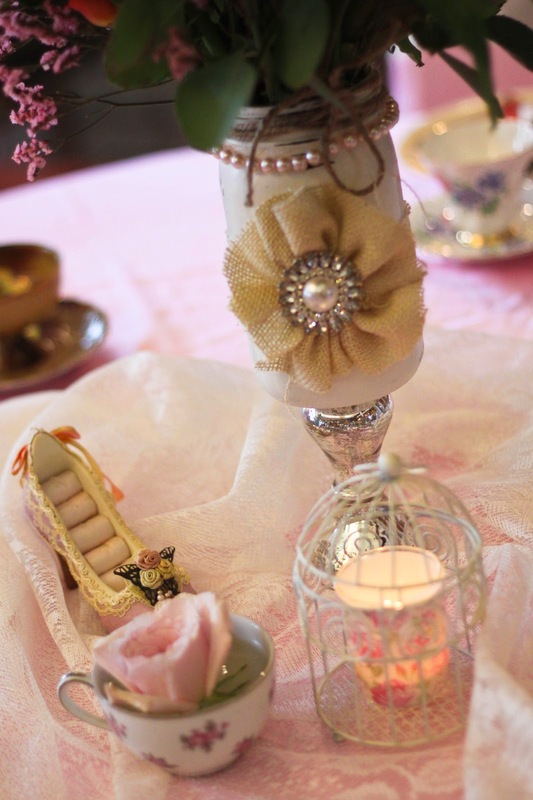 There were candles in bird cages, tea cups with roses in them, tea cup candles (that my mom made!) 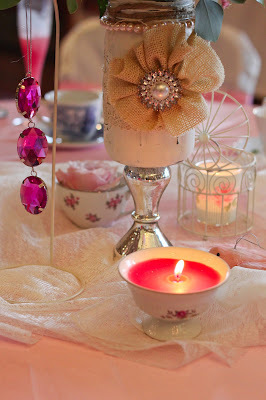 and precious shabby chic looking ornaments hanging from ornament holders. Each table was so different and unique. I asked my mom where she found all the amazing table decor and she said she collected it from various antique stores, thrift stores, Michael's, Hobby Lobby, Frisco Mercantile & Ebay! 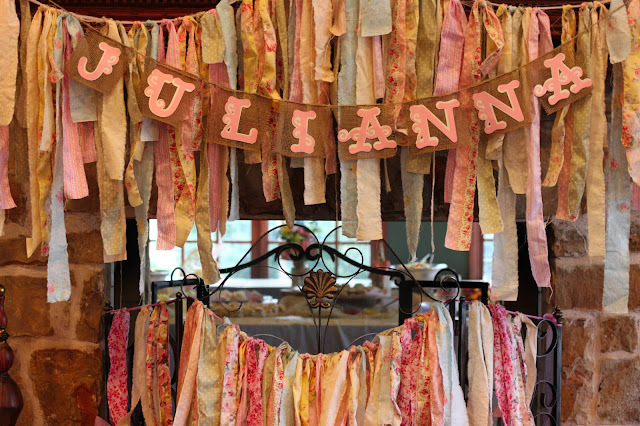 (Fabric Banners) One of my very favorite things about the shower was the gorgeous fabric banners that were hanging everywhere! Once again my talented, crafty, mom made these. She said she found the idea off of Pinterest and then took it to a whole new level haha. 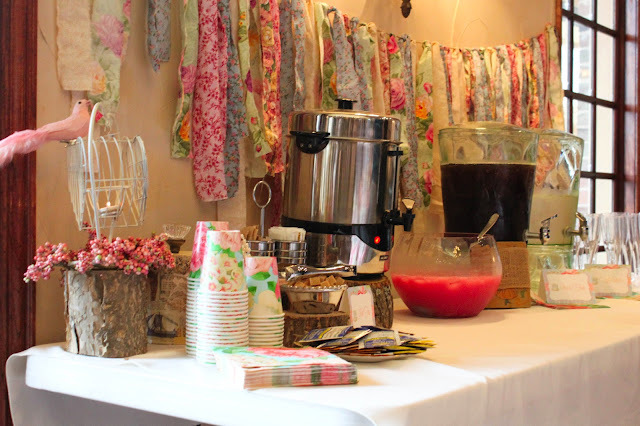 She went to the fabric store and purchased various types of floral fabric, cut it all into strips and tied it onto ribbon. 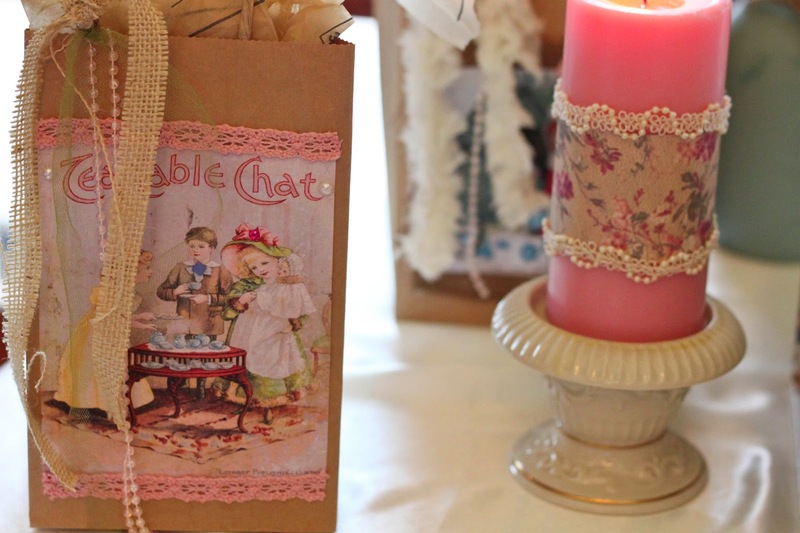 She then bought burlap and cut it into squares and strung it onto twine. Of course my mom has a Cricket machine (she bought it when she helped me plan Josselyns mermaid birthday bash) so with the Cricket she cut out letters to glue onto the burlap squares. 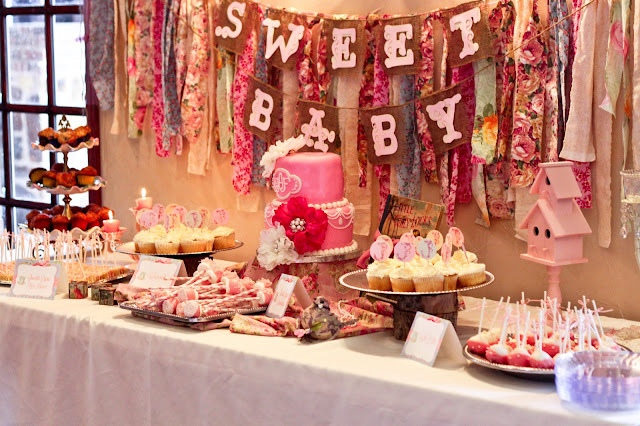 I seriously love these fabric banners so much that in a couple years I am going to have to have a tea party birthday for one of my girls just so I can reuse them. (Paper lanterns) Paper lanterns are a fun way to decorate a big room! 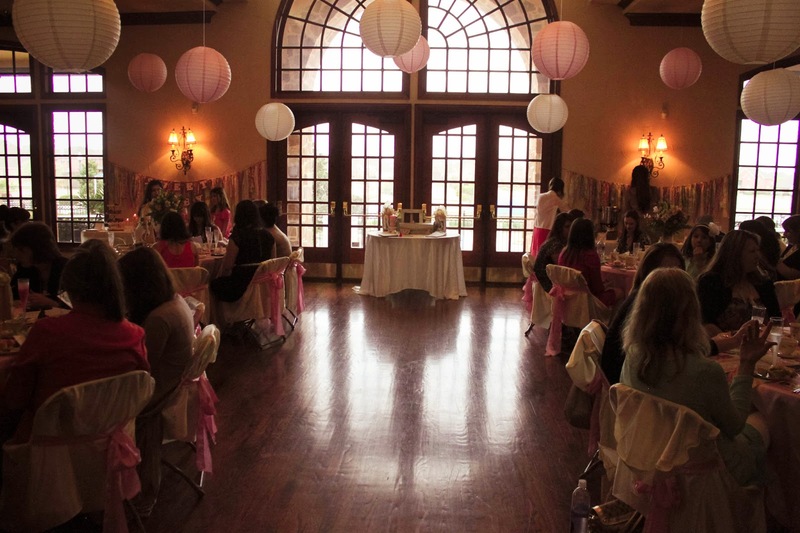 And the ball room where the shower was at it is definitely a huge room that can be difficult to decorate. 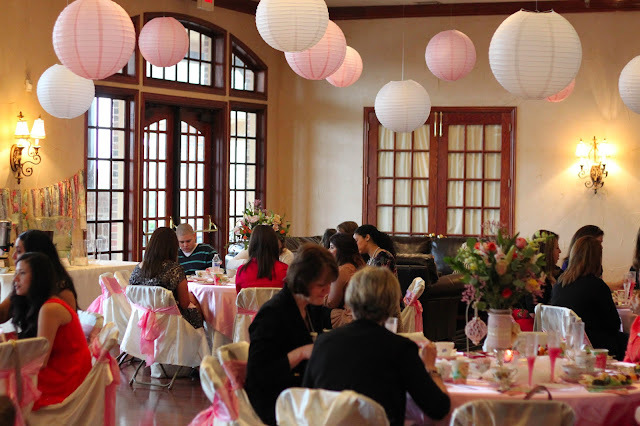 It is kinda funny because I actually had all of the pink & white lanterns from previous parties I have thrown, so when a couple of the hostesses asked if they could use them for my baby shower I was beyond excited that they were going to get even more use! 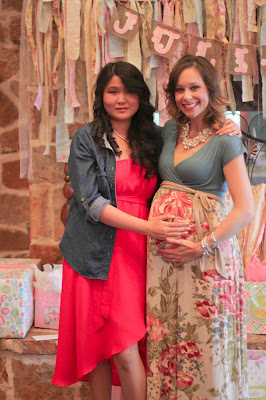 I guess in a way I was able to contribute to my own baby shower haha. Tea Cups: Well, you can not have a tea party without authentic, vintage, tea cups (at least that's what my hostesses said!) They had the most gorgeous tea cups & saucers at each place setting! My mom suddenly decided to start collecting tea cups lol so she gathered together some beautiful cups. 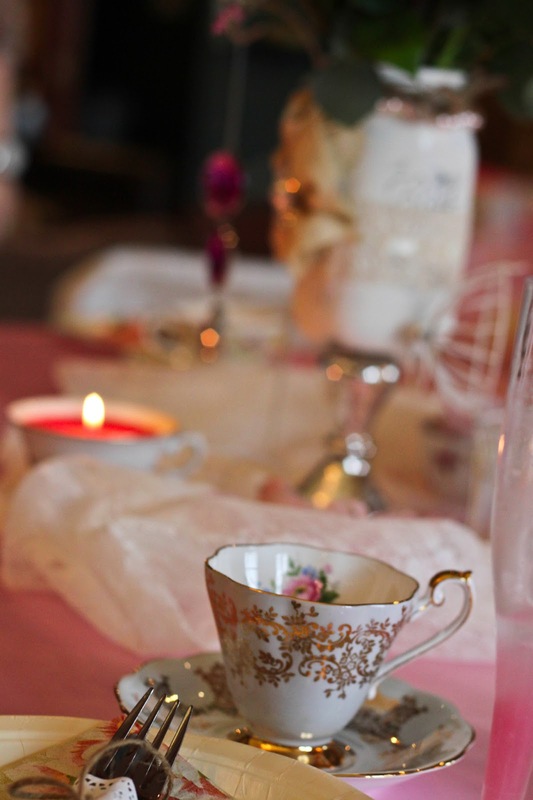 Gail, my mom's sweet friend, brought 15 of the most beautiful heirloom tea cups (they were her grandmothers). 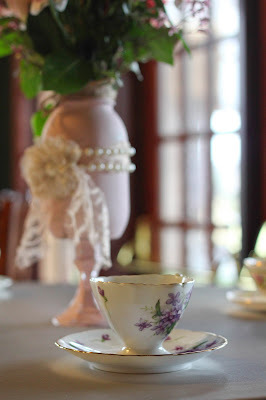 My mother in law brought some gorgeous tea cups from China that were her fathers and my friend Amber did a little antique shopping in Midland and found some pretty tea cups as well! All of the various tea cups from literally all over the world looked so lovely & elegant on the tables. 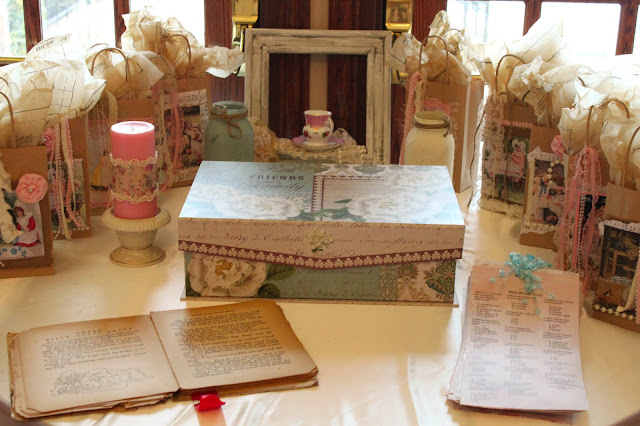 Lisette also had tons of newborn diapers in a gorgeous shabby chic box. 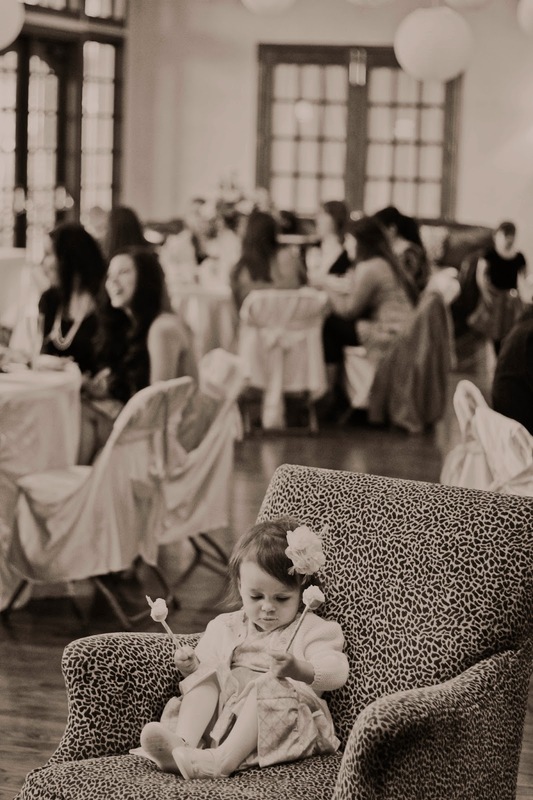 All of the guests wrote little notes to me on the back of the diapers. 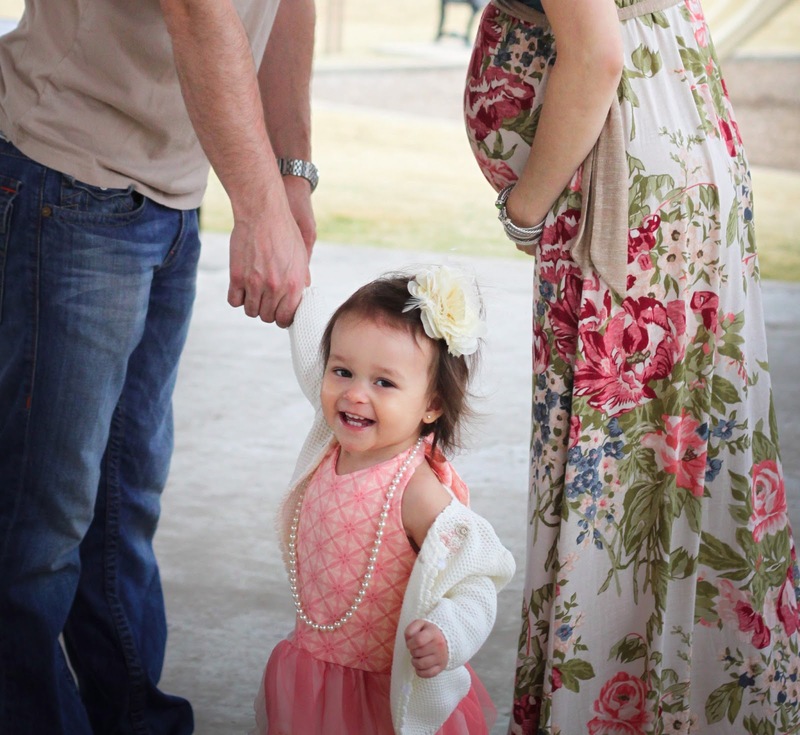 I guess they are hoping that I will find some sort of humor and joy in changing a million diapers those first few weeks when Julianna is born haha. My favorite game was this clever baby trivia game. 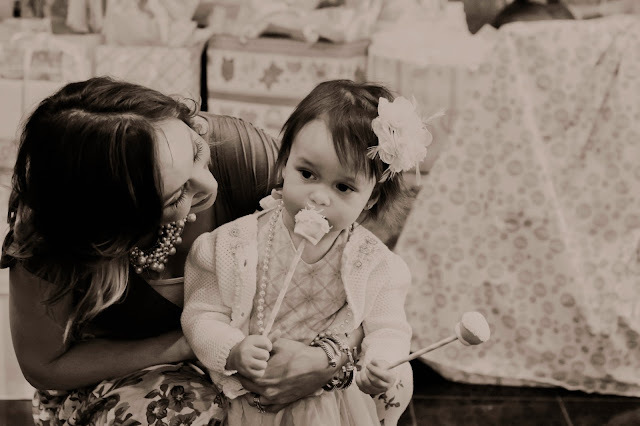 The game asked questions about babies, motherhood and even about me. It was not an easy game but everyone had a so much fun guessing the answers. 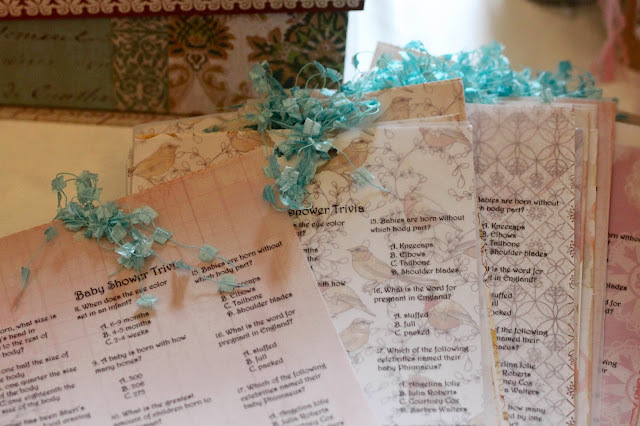 Even this game was printed on shabby chic paper with velum and ribbon on top...it was so cute! 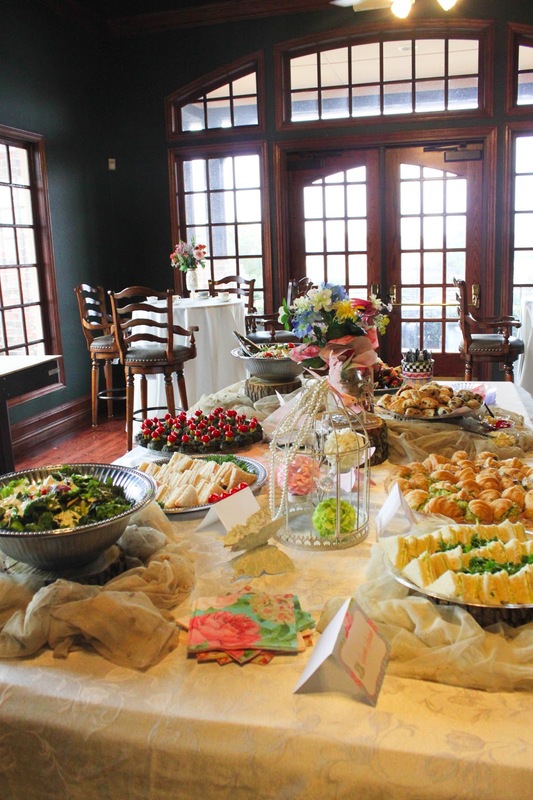 Food: When you think of a tea party you automatically think of petite sandwiches and dainty finger foods. My amazing hostesses whipped up an amazing spread of delicious tea party treats. 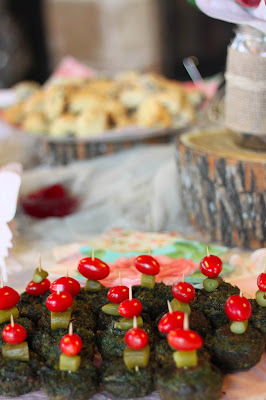 There was a variety of mini sandwiches. There were amazing cucumber sandwiches that my sister in law Stacey made (I ate at least 6). There were also turkey sandwiches, chicken salad sandwiches, tuna sandwiches & yummy chicken pesto sandwiches! There was a variety of different scones with homemade jam, lemon curd and to die for Devonshire cream. There was coocoo sabzi "Persian quiche" that Lauren & her sweet step-mom Naihd made. 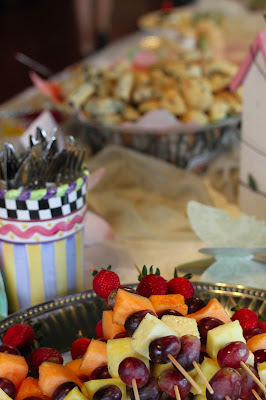 Lastly, there was pear & gorgonzola salad and delicious fruit kabobs. Sweets: Every tea party menu is full of sweet treats and we definitely had a variety of sweets to choose from! 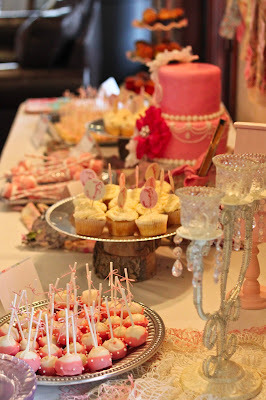 There were mini muffins, delicious cake balls (I love Olivia's cake balls! 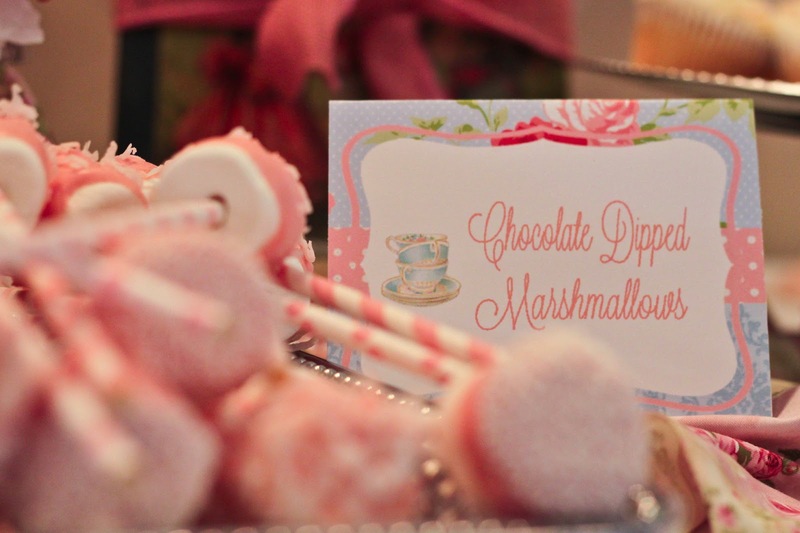 ), mini rice crispy treats dipped in white chocolate & marshmallows dipped in white chocolate (those were Josselyn's favorite!). Plus, there were amazing cupcakes. Cake: I just love fabulous, fancy cakes! And no one can design a cake like my girlfriend Kylie New. 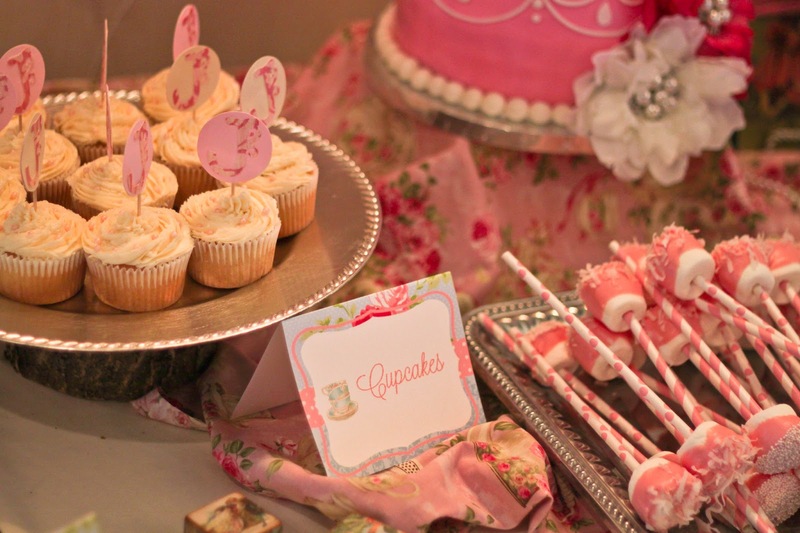 Kylie designed both Josselyn's baby shower cake and 1st birthday cake. Even though Kylie retired from cake making she some how still ended up getting conned into making Julianna's cake and I am so glad she agreed haha. Kylie lives in Midland so she had to drive 6 hours with the cake in her car!!! 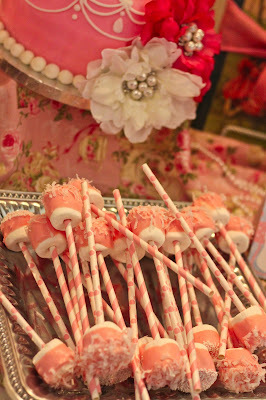 Kylie is simply the best and I just loved the sweet, beautiful, cake that she made in honor of my baby Jewel. Party Favors: I just loved the party favors that were given to each guest. 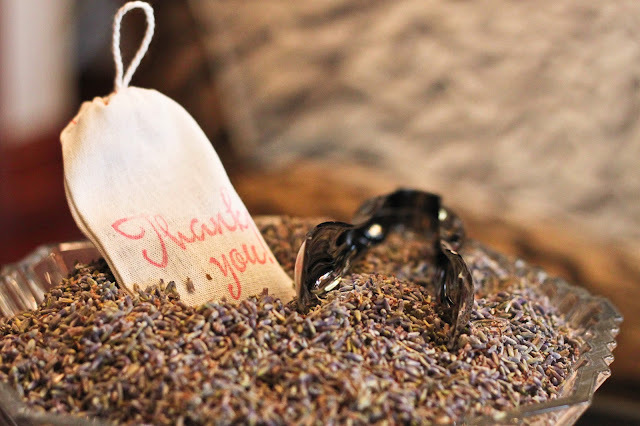 There was a beautiful crystal bowl full of organic lavender and all of the guests poured the lavender into little draw string bags. They made the cutest drawer sachets! Hostesses: A baby shower this gorgeous and perfect takes an army of talented, creative, women to pull off and my amazing hostesses went over the top and threw the most incredible shabby chic baby shower ever! The whole thing was more beautiful than I ever dreamed of. I am beyond thankful and grateful to have such sweet friends in my life. 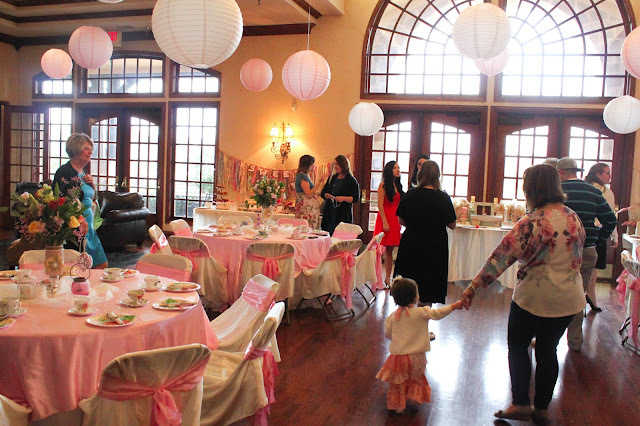 I absolute love everyone of the girls who worked so hard and contributed so much to mine & Julianna's special day. A special thanks to my mom Rosemary Couvdos, Lauren Stack, Christina Hernandez, Jennifer Spataro, Stacey Alcala, Lisette Sumemers, Olivia Ainsworth, Kathie Harden, Kate Cotter, Amber Hall, Yadis Alcala & Nahid Afghahi. I am honored to have these ladies in my life and I love each and everyone one of them so much! 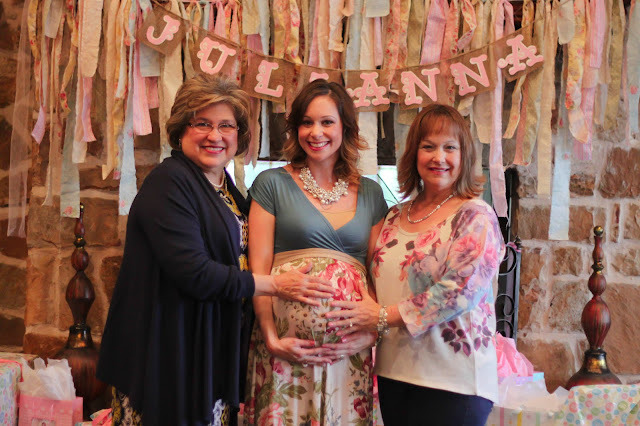 The one thing that touched my heart even more than the gorgeous baby shower was seeing all my dear girlfriends who came to celebrate the upcoming arrival of Julianna Faith. One of my very best friends Krista, flew all the way from Phoenix (on a red eye flight!) for just one day to be at my baby shower. 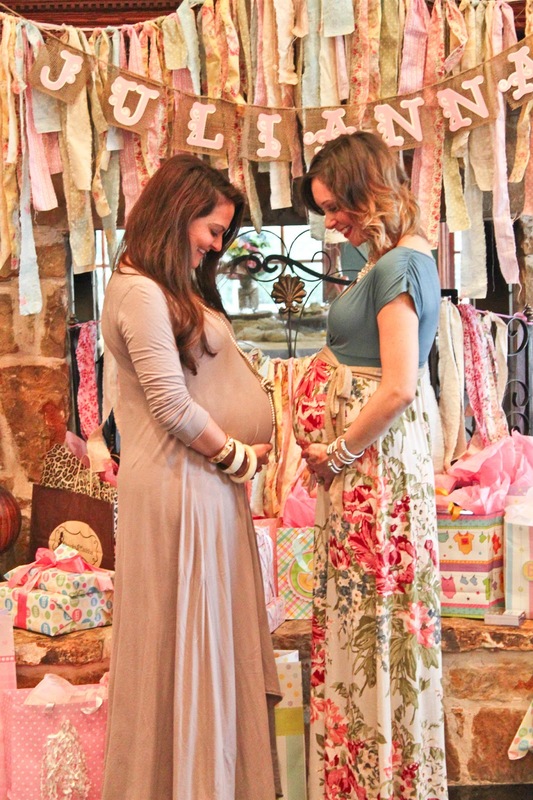 Krista and I went through our first pregnancies together and we have a very special bond. It was really hard for me when Krista moved to Phoenix this past January and it meant so much to have her there at my shower. One of my other very best friends Amber drove all the way from Midland (6 hrs) to come and celebrate baby Jewel! She got lost along the way but she pulled in to Dallas at 4am the morning of the shower! Amber is a true, loyal, friend who I love with all my heart. It also meant a lot to not only have my mother in law Gloria come from Lubbock but her 2 precious sisters Sylvia & Hilda drove from Cibolo & San Antonio to be there as well. I know I am a bit emotional & hormonal, but it was so wonderful to look around the room and see my amazing family and wonderful friends there at the shower. 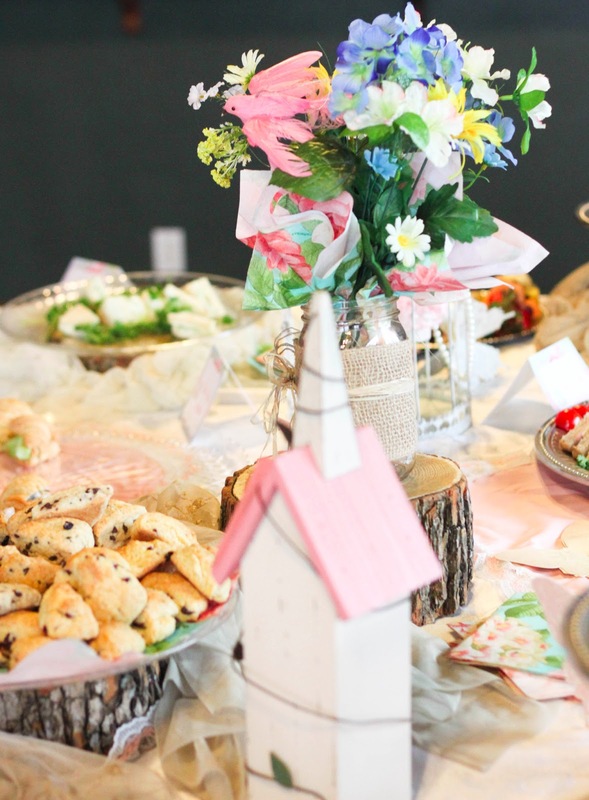 It really did mean the world to me to see neighbors, sweet friends from church, Invictus, Junior League, and other special ladies who are in my life at the shower. As a woman, I know first hand how hard it is to make time for everything that goes on in life, so I am truly thankful that all these girls took time out of their busy schedules to spend the afternoon celebrating baby Julianna. I truly was so overwhelmed and humbled by all the love I felt. It really was a perfect day that I will never ever forget. Oh yah...believe it or not I had been sick the entire week before the baby shower and the day before it the doctor said I had bronchitis! So, I was definitely under the weather for the big day and I had no voice, but sickness and all I still felt so happy and on top of the world. 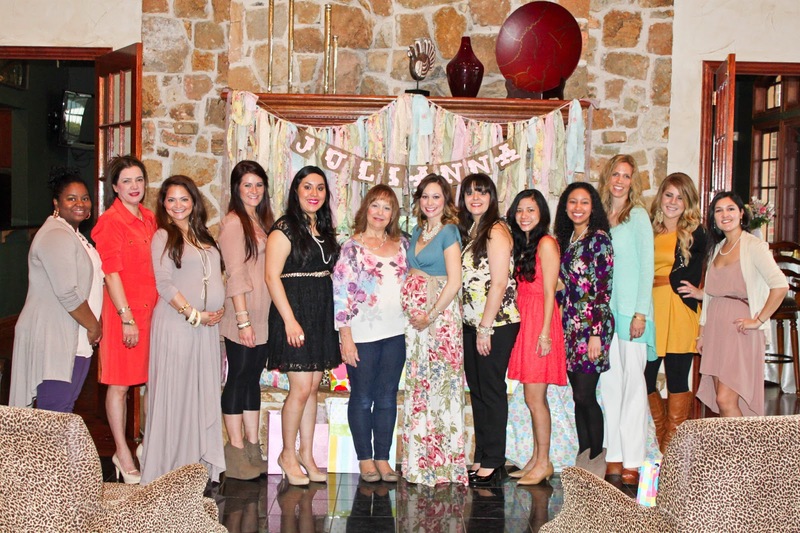 So there you have it...Julianna Faith Alcala's beautiful shabby chic baby shower! 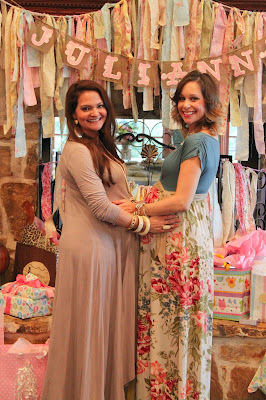 Loved this post and I must say it was a beautiful shower! Thanks for giving me a shout out! Cant wait for this weekend! 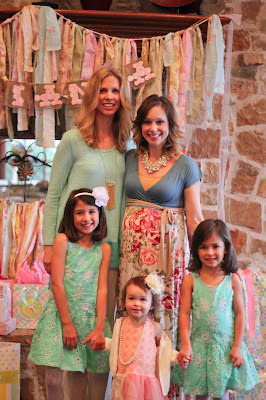 Gorgeous baby shower! Can I ask where you got your dress? Wow! 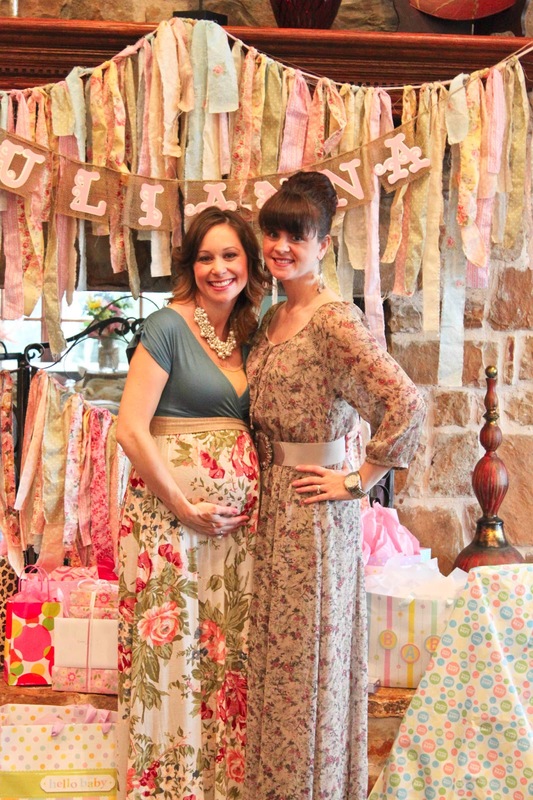 this is surely one of a kind baby shower celebration! 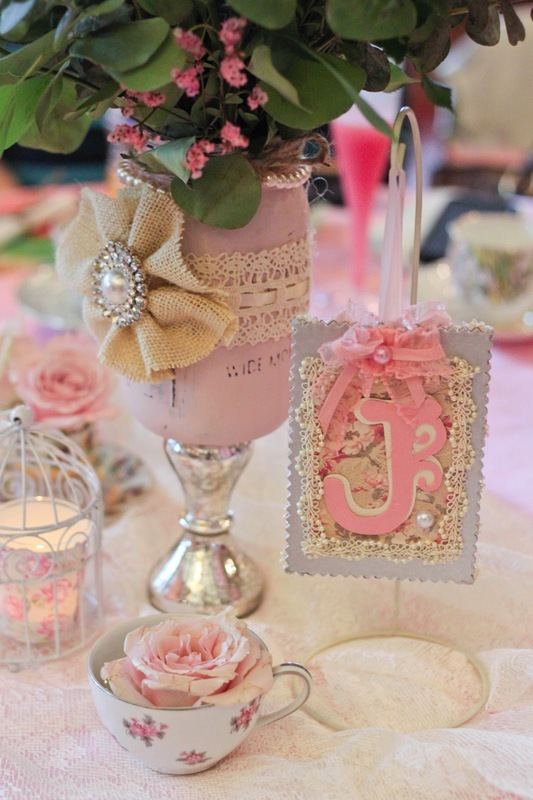 How I love those favors. 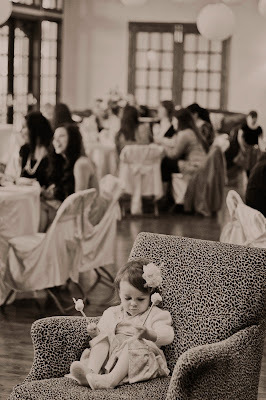 The photos captured the atmosphere just perfect. 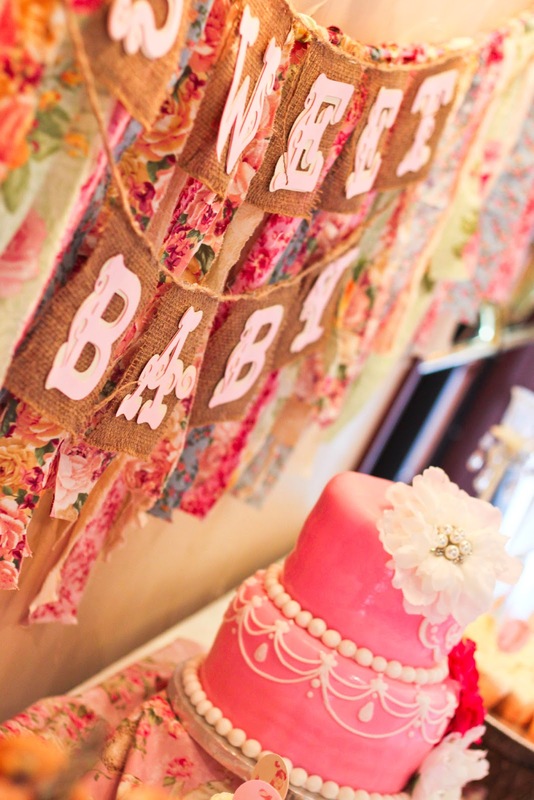 And I love your chosen baby shower decorations and themes. Thanks for sharing!